I love these for all the Grandchildren. You have most recent pic in middle and with the limited space I have...all previous pics showing too! They are some work as you have to fit pics in just right to show in the mat, but for the price, I feel it is well worth it. Amazing to see how fast each year fills up! this most useful. with the addition of a 4th child i couldn't find a match to the othe school day matts I had and this was a very inexpensive fix. [...]The experience was one of the best customer services I have received. The frame and mat were better in person than the picture showed. I've seen these in other people's houses and now that my girls are starting school I had to find them. They are such good quality and the mat is nice and thick. It will be so nice to see all their pictures side by side and watch how they grow over the years. I was afraid after reading some reviews about the size but I think they are perfect. However for the big picture In the center, I found that a 4X6 didnt quite fit. I needed a 5X7. The smaller ones are 1.5 x 2.125 not wallet size. cardboard hole, then pressing to make it stick. Then turn it over and finish taping the picture on. I am giving it to my son and daughter in law for Christmas. My granddaughter will be graduating from high school, so this completes the circle. I liked it so much I even bought one cor myself. I ordered 1 and then went back and ordered 2 more. Wish we had these when our kids were little. Still may order 2 two more at a later date. Great way to see how your children change throught the years. good product for the for what we need. I have one for my son and just had to buy one while I still can find it for my daughter's school years. 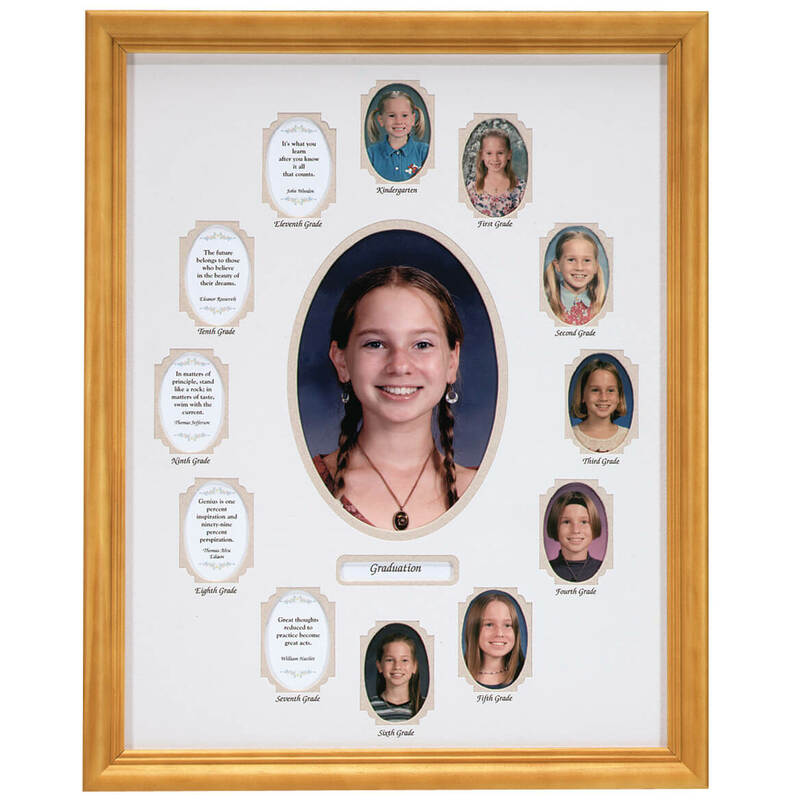 I purchased 2 of these School Years Frame Sets last year for my 2 grandchildren, but now find out that I'm going to be a Grandma again for a 3rd time..I was hoping that I could find the exact same Frame Set now, so that they would look nice together on the wall and surprisingly, Miles Kimball still offered it! Thanks Miles Kimball-I know their parents will love this gift! Handy way to compare changes in each school year. I love the matting to hold pictures. It's perfect to see how your child has grow up right before you eyes. I bought this when my daughter was in Kindergarten and now she's graduating next year. It got really beat up through the years and I was extremely thankful that I could find a replacement. I bought a very nice frame because I felt the frame that came along didn't do the matting justice. But the product is well worth the money and I wouldn't let that stop me from buying it. I love these frames; I purchased three of them for my grandchildren. It is fun to fill in the years as you go and then, have a complete cycle of "the school years" of your kids! The picture frame is well made, excellent craftsmanship. However, the holes for the pictures are small. They will not hold a wallet sized picture, just the head (if you are lucky and have a full torso picture). The mat is excellent quality, however the hole for pictures is quite small. It will not fit a wallet-size photo. I will need to have special made prints to fit, or try ordering the "exchange size" from our school photographer. The frames are cheap. I saw no option to purchase them seperately, however they shipped seperately. I will purchase higher quality frames for the mat which means that this purchase was grossly over-priced for the quality product you receive. Loved the frame...photo space too small. Still have product...didn't give away! Hated small area for photo's. I had these for my own kids, have purchased 6 for my older grandkids, and these are for the last four grandkids. They are great to look back on when the kids are grown. I have 4 great nieces and a great nephew and it will be great to see how they change over the years. My great grandson just started school. I will order another one when his brother starts next year. Have always been pleased with my purchase. I have one that has just been completed and wanted to get these two for my Niece & Nephew to completed for their girls. I like the fact that these include Kindergarten pictures. web site easy. product fair price. nice selection of items. Items usual delivered in a timely manner. I have two grand daughters in kindergarten and I thought it would be good to start early. 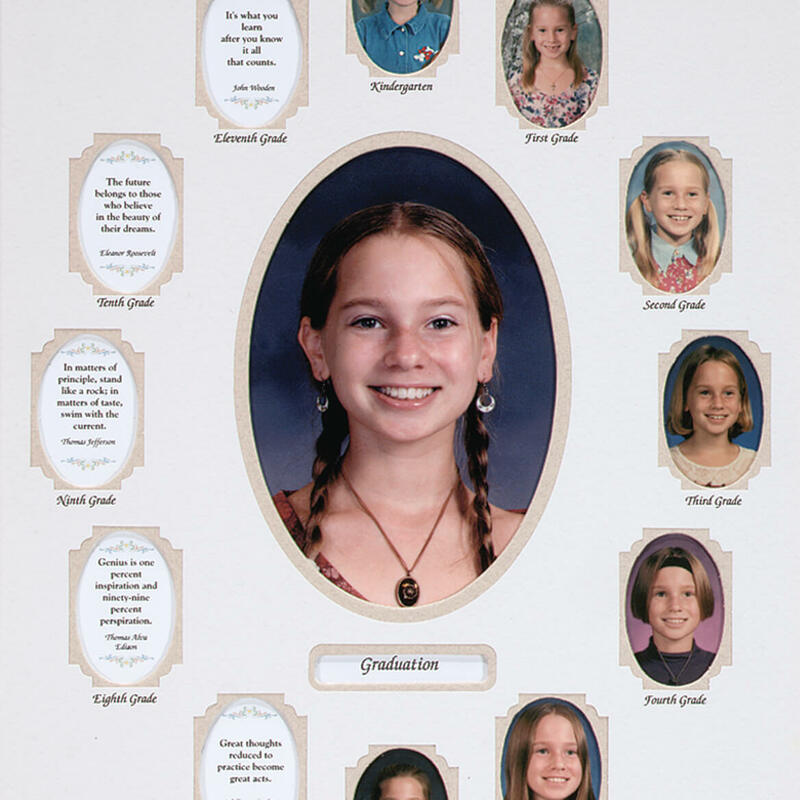 I have one of these that I used for my daughter who graduated high school in 2003. I've been looking for one of these frames so my daughter can use it for my granddaughter. Had purchased 6 frames several years ago for my 6 grandchildren - just got 2 more grandbabies and needed to find a photo frame for them. I have a very similar frame for my children's pictures from 30 years ago. I like them so much I am getting one for my grandson! Should have bought this years ago. Hope I can find the pictures going back to Kindergarten to update it. I was given these frames when my 5 children were growing home and I was happy that I could find the exact frames and they are being purchased for their children which are my grandchildren. I always enjoyed looking at their photos from each tear to see how they have changed and grew. Passing it on to the next generation. This is a perfect snapshot of my child every year. I will enjoy it for many years to come! My daughter needed this for her 3rd child. Bought for my two kids for their school years and now wanted one for my grandson. Only concern is the color of the frame is not the same as years past. For my grandchildren at graduation. I bought one of these frames for both of my children growing up. This one is now for my granddaughter. I love them. My mother in law has her 3 kids in similar frames and some of her grandkids. I wanted to complete her collection. Have a grandson graduating this year and a second one in a couple years. For my grandson's school pictures.I bought these for all my nieces and nephews when they started school, as well as for my children. So my grand boys can look back on their school years, especially; the change in their appearance. Always wanted one of these but never had one before the kids were too old. Got it for our grandson. Have these for my daughters and wanted one for my grandson's school pictures. Did one of these for my first two grandchildren and now for a third one. Really nice mat. I currently have a frame for both of my daughters and I enjoy seeing how they have changed from year to year. I now have a grand child starting kindergarten and I want to have the same experience with her. I have a child graduating this year from high school and want to organize his pictures and have same frame for the next children that graduate. Had them for my children so I wanted them for my grandchildren. It is a great and fun way to watch your child as they grow up each year. And I am hoping it will be a great thing to set out at graduation when that time comes for my kids. I have bought this frame for my 4 grandchildren who are already in school, and will continue getting them for the next six. So sweet to be able to see the added photos each year! The reviews were mostly positive particularly for the mat. I wanted the small openings to suit the size that was part of the old classic school photo package. I was looking for something simple. I hope when I receive the item I am pleased with my choice. It would be nice to see a few other options for frame color. someone in my family has it. I have 1 granddaughter in kindergarten and another that will be turning 1 shortly! These will be a great way to keep their school pictures!! I have these for my daughter's who are in their 30's and now buying for grandchildren. Seem they may be a little different but I'm sure the quality is still there. wanted to match frames that I had for my older children years ago and couldn't find this anywhere else. are these available in any store? BEST ANSWER: Thank you for your question. We do not have any store locations nor do we sell this item in any stores. We hope this information will be of help to you. Can you order the mat without the frame? BEST ANSWER: Thank you for your question. Unfortunately no, it comes in a set. We hope this information will be of help to you. What size are the small picture openings? BEST ANSWER: Thank you for your question. The smaller picture openings are 1 3/8” wide x 2” high.We hope this information will be of help to you. Can you make it in yellow/gold? Yellow mat with gold edging?